Mia Goth is not your typical actress. A tough-nut crime protégé in Lars von Trier’s Nymphomaniac and the face of a banned Miu Miu campaign, the 22-year-old sensation crawls through muddy hell in her latest film The Survivalist, a Bafta-nominated thriller in which she’s the secret weapon: fragile and taciturn, but bloodthirsty enough to be among the last humans alive. And though she can’t discuss it yet, up next is Claire Denis’ existential sci-fi High Life. Directed by Stephen Fingleton, The Survivalist transforms its Northern Ireland setting into a post-apocalyptic wasteland. Civilisation has collapsed, and its dwindling resources are up for grabs. Always gripping, the film plunges its core trio – Milja (Goth), Kathryn (Olwen Fouere) and “the survivalist” (Martin McCann) – into a psychological chess match of wit, grit and questions about how mankind allowed this to happen. In person, Goth is thankfully not the nearly wordless, intimidating antihero she plays onscreen, but warm and optimistic, offering numerous wise insights on the way she goes about her craft. We spoke to her about The Survivalist, taking roles outside her comfort zone, and not showering in the name of art. Your films are all really different. What drew you to The Survivalist? Mia Goth: What attracted me to Milja was the strength she demonstrates in the face of adversity. She’s experiencing both the struggle of this extremely vicious world, and the growing pains of developing into a young woman. The script was a page-turner and so compelling. I’ve never read anything like it. It’s such an honest portrayal of what our world is, and how it’s come to an end. Was it as tough to shoot as it looks? Was it your Revenant? Mia Goth: It was intense! For instance, the diet we had to feed on was extremely limited. We were on a strict calorie intake of 900 to 1,000 calories a day. Our bodies had to reflect the world we were living in. That was a real challenge, having to work and concentrate on a day’s work with so little energy. I camped for the majority of the shoot. I slept outside for five weeks. That wasn’t easy. And I didn’t wash, so hygiene became a little bit of an issue at times. It was tough but extremely rewarding. Do you want people to leave cinemas thinking about what The Survivalist has to say about politics, the environment and things like a potential peak oil collapse? Mia Goth: Yeah! The Survivalist really makes you think. It stays with you. In many ways, everything that happens in the film is happening right now in certain parts of the world. Look at places like Syria, for instance; the government’s collapsed, people are dying. It forces you to consider issues you’d otherwise choose not to think about, that perhaps our world isn’t as secure as we think it is. Stephen used a phrase that stuck with me: the apocalypse is already here – it’s just unevenly distributed. Mia Goth: No. We’re sitting in a world that’s in desperate need, definitely, and there are huge things humanity has to do. Mankind is very capable of adapting to climates. I think ultimately The Survivalist is a film of hope. Even though our world is no longer the world we know, everything is going to be OK in the end. Your performance is very physical and full of little details. You actually eat the food – whereas in most films, actors tend to push the food around on the plate. Can you tell me about preparing for this side of character? 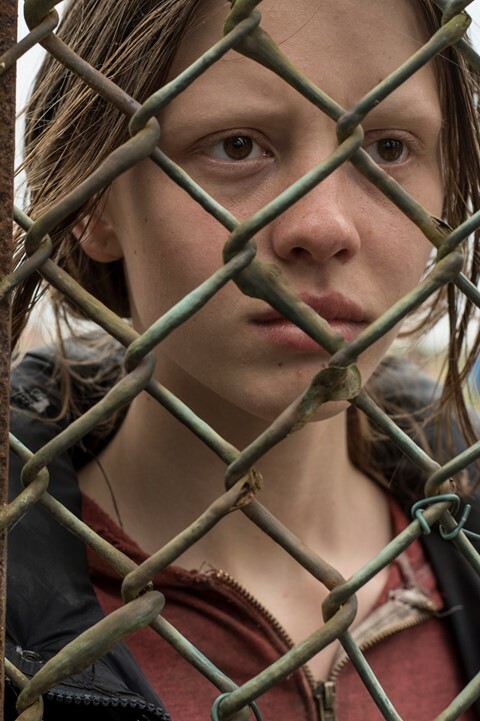 Mia Goth: In the lead-up to The Survivalist, I saw a trainer five times a week and I’d run an hour a day. Three weeks before shooting, I packed my bags and got to this remote part of Northern Ireland. I’d walk through this long beach, and the beach would lead into a forest where I’d camp. That’s what I did for the whole lead-up to the shoot. I did that essentially to walk in Milja’s footsteps. When we meet Milja and Kathryn, they’ve been walking for weeks, trying to find shelter and safety and food. If you do that side of the physicality, the dress or makeup of the character isn’t needed. Because if you’re really doing it and honestly portraying that role, then the rest comes pretty easily – for me, at least. I read you had a lot of input with the script. Mia Goth: In Belfast, we sat around a table and workshopped the script. Stephen made us a game: anything we didn’t need in the script, we’d cross it out. We went through the script over and over again. We’d go through the scenes and consider, for instance, is this dialogue needed? Is this scene needed? Do we need another version of this scene? Is this dialogue correct for the character? It was fascinating to be included in so much of the creative process. As you say, there’s not much dialogue, and I like how little we’re told – verbally, anyway – about how this world collapsed. How much backstory were you given? And did you invent any yourself? Mia Goth: It was the same for us. We had a general idea. Stephen gave us a brief outline – issues such as global warming and overpopulation. But for the majority, we created our own backstory. I had to decide whether Milja grew up in the world we know, or if she was born into this new system. I decided if she was born into this post-apocalyptic world, there’d be more character nuances and intricacies. Kathryn warns Milja, “You’re getting sentimental.” In this post-apocalyptic environment, is sentimentality a weakness? Mia Goth: I don’t think it’s a weakness. Given the situation we’ve been in for such a long time, we’re conditioned to push our feelings aside and function off an extremely primitive survival mode. We need to get through the day. It’s scary – you don’t want to show your emotions. Stephen described you in an interview as a brave performer. Do you consider yourself a brave performer? Mia Goth: I don’t know about “brave”. But I’ll always commit to whatever the page says for me to do. I just want to do justice to my characters. I want honesty. I want to be vulnerable. I want to go all the way with it. You don’t do many interviews, and you don’t do social media. Does that help on the acting side, to keep that mystique? Mia Goth: For me, it creates a better platform for when I do work, so people don’t know so much about me. If they know what I ate for breakfast on Tuesday, and then I have to transport into a different world entirely – well, that suspension of disbelief becomes easier if there’s a barrier. If you’re not on Twitter, I guess you haven’t read Fem Script Intros? Mia Goth: No, what’s that? A producer is going through screenplays and posting sexist character descriptions for female leads. Is this a problem with the scripts you’re reading? Mia Goth: More can always be done for the range and depth of characters available to actresses. But I do think it’s getting better. There are directors out there that create fully dimensional female characters. Look at someone like Stephen or Lars or Pedro Almodóvar. They really honour women and celebrate women. These directors really understand and appreciate the performance of a woman. Speaking of Lars, you’re fundamental to Nymphomaniac and pull off such an emotionally complex role. Is it strange that the bit lots of people talk about out of the whole four hours is when you piss on Charlotte Gainsbourg? Mia Goth: If people remember me for any scene in a Lars von Trier film, I’m extremely honoured and forever grateful. If it’s that scene, then that’s cool. I’m happy with that. I wasn’t uncomfortable doing that scene. The entire shoot of Nymphomaniac was done with extreme sensitivity and extreme care. Are there any other dream directors you’d like to work with? They might read this and cast you, if they’ve set up their Google Alerts correctly. Mia Goth: The French director who did Rust and Bone – Jacques Audiard. Gaspar Noé, Bennett Miller, Paul Thomas Anderson, Iñárritu; I think they’re incredible directors. Are you deliberately seeking roles outside of your comfort zone? Mia Goth: I think any actor, if they had the choice, would opt for challenging roles that test their capabilities. I’m definitely drawn to roles that push me beyond my limit, but ultimately I’m drawn to characters with depth and complexity, roles I feel are portrayed honestly. That happens to be the films I’ve been fortunate enough to take part in. The roles I take on are extremely personal decisions. When you’re an actor, it’s like being an investigator. You put the pieces together. It’s problem-solving. There’s a chance I could fail taking on these roles. But if there’s a risk of failure, there’s an opportunity to succeed. And that’s exciting – taking roles that scare me.